Counter depth frig? - Could you please tell me the make/model? Hi Pamela - did this fridge come with stainless steel sides on the doors? Or did you apply panels? I can only find them with black sides. Any help would be most appreciated! We did not apply/install any additional stainless panels on the side. I believe it was a JennAir refrigerator, precise model would be discontinued by now. I don't think the sides are stainless, more likely just grey in color, You should be able to find several freestanding refrigerator models with grey sides vs. black in a variety of manufacturers. 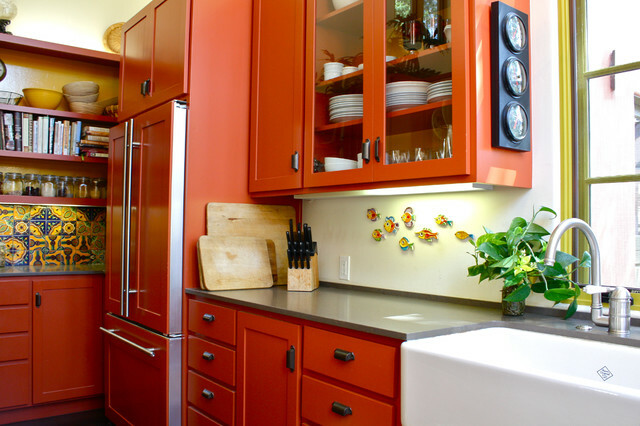 can you tell me the color of used for your beautiful cabinets? They are Caesarstone Lagos Blue in a honed finish. They still make the color but I don't think you can get the honed finish any more. what kind of hinges - What type of hinges did you use for your lower and upper cabinet doors and how are they installed. I don't remember whether we used Grass or something similar. They were installed by the fabricator. Sorry - I don't have that information. Backsplash - What is the backsplash made of that makes it magnetic? It is not magnetic. They found those fish tiles and put them up with blue-tack. Hidley decided on glass doors to show off their glassware in the upper cabinets. The clear doors provide an appearance of being open, without the risk of items falling out, breaking or becoming covered in dust.The couple chose honed Caesarstone countertops for a more earthy feel. 9. Sharpen knives. If you notice your kitchen knives getting a bit harder to use, that's a sign they are due for a professional sharpening. Regular sharpening at home can help extend the life of a sharp edge on knives, but once that edge is lost, only a pro can bring it back. Make a date to drop off your knives.